After writing about journalists not being special, sometimes sacrificing truth and opposing for opposing’s sake, further reading revealed to me that some journalists act as they do because they believe journalists should be adversarial. Because of the belief that journalists are “defenders of democracy,” which in turn is partly because of the recommendations of the Hutchins Commission that I cited, they believe they should oppose something in anything they write. While I do agree some oppositional actions apply at times, such as during Watergate, the My Lai Massacre event and the McWane company safety negligence investigations, I believe many journalists today often oppose the wrong things and do it at the wrong times. One of my favorite documentaries right now is BBC’s Synth Britannia, since I am a lover of 1980s synthesizer-based music. But this documentary also noted that some of the British press at the time, perhaps influenced by traditional musician groups and because electronic music was new at the time, were very harshly critical of such musicians. Gary Numan was mentioned as the first big star of the synth world, but be had a short career performing live. As Andy McCluskey of OMD (Orchestral Manoeuvres in the Dark) said, “Numan’s career was shortened by the nasty vitriol of journalism.” And not only him. Martin Gore of Depeche Mode mentioned in the same documentary that they would get into arguments with journalists who believed that their music wasn’t real music. I’m also reminded of that Jingle magazine music writer who always gave Duran Duran the fly (lowest) rating in reviews, which angered many local fans of the group then. But it’s good these musicians weathered the vitriol and are still active today. Perhaps these music writers have that tendency to be nasty self-appointed critics. They might be claiming, “we’re trying to save the world from mediocre and pretentious music! (by the way, I wrote about music in another article)” But that sounds a lot like social justice warriorism – the actual pretentiousness. Behind all that, they’re actually just trippy jerks. Some may argue, it’s not really news, it’s feature writing, so being trippy jerks in this field is normal. But it’s still rude and unbecoming. 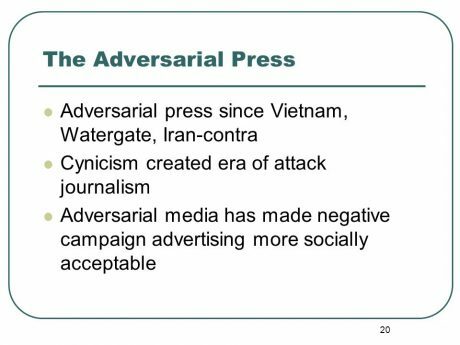 If they had training that told them, “journalists should be adversarial,” perhaps they wanted to apply this to non-current affairs coverage such as music. But it was misapplication, and such people came out as pompous and self-righteous egotists. OK, so we’re not talking about music, but news. Yet, being adversarial is still overrated here. As I said in my previous article about opposing for opposing’s sake, opposition should only be done when necessary. It should not be a “trip,” nor should it be done for personal dislikes. Indeed, it has been admitted that adversarial journalism can be abusive, so it is wrong to claim that adversarial journalism is always right. In fact, if you like being an adversary, it may be because you like to cause trouble and suit your own dopamine fix, rather than contribute to a peaceful world. It might even be traced to what’s called in the mental health field Oppositional Defiant Disorder or similar. Yes, opposition can be an abnormal thing at times. Besides, avid trouble-causers who claim to be saving the world are self-contradictory. The problem with some adversarial journalists is that they might even be inciting violence against certain people. For example, Gary Numan said in Synth Britannia that aside from people who’d love him, there would be people who would just want to throw a punch at him, probably primed by what they had read to act that way. What if a writer actually said, “if you see that guy, go ahead and throw a punch.” That is not only defaming but encouraging crime. It would be wrong even if the target were suspects whose part in crimes has not been proven, such as President Duterte. In any writing, using bias to bring down someone for no good reason, or because they don’t suit your personal taste, isn’t good at all. While I believe it’s all right for people to express their dislike for something, the problem is when they express it in a manner that promotes violence and hatred toward it or encourages breaking the law. Also, one can recall that this adversarial attitude of the press seemed muted during the term of BS Aquino III. A few pockets of voices raised the necessary opposition to him because of his obvious mistakes, but many still painted a rosy picture of him even if he had apparent connections to corruption. That had made many people suspect the press was on his payroll. Perhaps such journalists had chosen the the wrong things to oppose, and themselves contributed to increased distrust of mainstream news media. Kudos though to Oscar Pineda of Sunstar for taking up the adversarial stance at the right time with the then-president. Perhaps it’s time to ask journalists, should you really be adversarial all the time? And are you being adversarial at the right times? Doing opposition just for its own sake is not only a waste of time and resources, but it also can betray actual malicious intentions. It’s probably even being done only for sensationalism purposes. And, here’s some food for thought for the egoists: opposing something by itself should never be cool. As I said before, stop trying to be cool, and just be honest. Journalism in the Philippines, compared to Vox, Politico, WaPo and NYTimes to name a few, is a rot. It is kindergartenish. What I can say, Journalists in the Philippines are outlandish and incredible people in their stupidity and idiocy. You could add to that a 1924 article about Journalists being Incompetent. That’s quite an issue here too. Journalists just want to get through it (makaraos) and have a story in despite not checking if they did it right. “Journalism in the Philippines, compared to Vox, Politico, WaPo and NYTimes” that’s not saying much when those Western corporate media rags you just cited are failing hard with their partisan propaganda, same garbage everywhere, whether it’s state owned or corporate media outlets or even the vaunted International Press like the AP or AFP. The mainstream media during the administration of Noynoy Aquino, was silent of all the corruption that were going on. They were always praising , Aquino, for his good works. Maybe, most of them were under his payroll. Journalism must not be adversarial. It must tell the truth and inform people. It must condemn, where a wrong is committed. It must give credit, where good work is done. Unfortunately, this is not the case now. Most of the mainstream media Journalists are paid to promote the political agendas of self serving politicians. It is the common blogger, or the Citizen Journalist, that , I trust more; because they often tell the truth and inform us. Although, some of the bloggers, are paid hacks also of politicians. It is good that the Age of Information Technology is here. Anybody, with a “two pesos” worth of opinion, can log in to a Website like, GRP, and write his opinion. It is the readers, who will decide, if it is with sense or nonsense. The self-proclaimed advocate of impartiality does not want to commit himself to either course of action. If pushed toward one camp, he seeks refuge in the other. Men always find it distasteful to admit that the “reasons” on both sides of a dispute are equally valid—which is to say that violence operates without reason. Tragedy begins at that point where the illusion of impartiality, as well as the illusions of the adversaries, collapses. ChinoF, I hope you wouldn’t mind, but, don’t you think you should have inputted more on the Filipino experience than Foreign references vis-a-vis your discussion of the supposedly adversarial role in Local Journalism in the Philippines? Well, I think adversarial journalism is more well represented in western countries since that’s where it came from. I believe those doing “adversarial journalism” here are actually doing it for partisan reasons, meaning, in support of politicians, owing to the fact that most Philippine news media is owned by politicians and allied businessmen. Anyway, feel free to add your own examples for further discussion. actually its not its a blog where people voice their opinions, where in philfail blog site are for expats & people who have bad experience in the country and they talk about it like therapy. Get Real Philippines is separate from the Philippine Fail Blog, and has been around since 1999-2000. We appreciate though that there have been other blogs and websites that dare criticize Philippine culture, because we need such voices. anyone here who came from the philipinefailblog.com? The reason it was muted in Yellow Man’s presidency is because the heada of media were almost entirely controlled by the Yellows. Godod piece. Opposition for opposition’s sake is a worthless exercise that only contributes to entropy and low trust. Definitely not the things that encourage recirpocity, which is absolutely essential in improving the country and building complex societies.